Can I File for Divorce in Florida Without an Attorney? If you are contemplating a divorce, you may be wondering whether it’s possible to file without retaining a Florida divorce attorney to assist you. 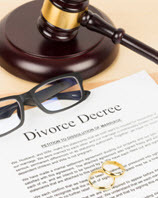 In Florida, a divorce is referred to as a dissolution of marriage. While it’s legally possible to file for a dissolution on your own, it is not necessarily advised in all situations. If you and your spouse have no children and very few assets, some attorneys may recommend you file on your own — especially in cases where you and your spouse are on friendly terms. However, if you and your spouse have children or have a large asset portfolio, we recommend contacting a family law attorney in Florida rather than filing on your own. Florida law allows you to represent yourself for a number of legal matters. Representing yourself is referred to by the courts as pro se. You may be giving up certain rights by representing yourself, which is why we recommend you at least meet with an attorney to determine whether filing pro se is the right decision for your situation. What if you missed a number of assets you didn’t know could be considered marital property? Does your spouse have retirement accounts, insurance policies, pensions, etc.? If you do not ask for a portion of these in your divorce, you are completely forfeiting your rights. Like a number of other states, Florida abolished fault as a grounds for divorce. The requirement to end a marriage is for one of the parties to show the marriage is “irretrievably broken.” Some courts may look at the reason the marriage is broken in special circumstances, such as determining alimony or the equitable distribution of marital assets. Before filing, you have to prove a marriage actually exists, and one of you needs to have been a resident for at least six months immediately before you file the petition. Florida allows for something called a collaborative divorce. This process uses trained professionals, and is a completely voluntary process that can be utilized before or after you file the petition for divorce. Both spouses and their attorneys will sign a participation agreement that discusses the process. Both spouses are required to voluntarily disclose all material information to negotiate in good faith. Collaborative divorce allows for the use of joint neutral experts to assist with the negotiation process. The desired end result is for parties to enter into a written agreement that will address all their issues. This can include dividing assets and liabilities, creating a parenting plan, and deciding on child support, alimony, and how attorney fees and costs will be handled. If the collaborative divorce doesn’t result in a settlement, the parties are required to discharge both attorneys and professionals and start all over in family court with a contested dissolution. If you are planning to file for a dissolution of marriage, consider speaking with a skilled attorney first. Contact the Law Offices of Schwartz | White at 561-391-9943 to schedule a consultation.